In my last post, I asked you to weigh in with your thoughts about pressure cookers, and oh boy did you! I was gratified to hear that so many of you do use–and love–your pressure cookers (PC from here on out) but was disturbed to hear how many of you are truly afraid of them. I was especially amazed to hear how many people actually own PC’s but are reluctant to use them. As a service to those of you who are scared of using your PC’s, I thought it’d be helpful to take you step by step through pressure cooking a simple recipe. One of the things that the PC is good at making quickly is vegetable broth; you can save up all the scraps and peelings from your vegetables, store them in the refrigerator or freezer, and then in about 15 minutes make your own, basically free, vegetable broth. I like to make a very simple broth that can be made with a head of garlic and just a few other common ingredients and can be used anywhere a chicken-style broth is called for. It’s a light colored broth that may be lightly or heavily flavored with garlic, depending on your taste. The photos below are of my Kuhn Rikon 7-liter PC, so the way the pressure is indicated will vary depending on the type of PC you use. The basics are the same, though, and most “second generation” cookers will have similar safety mechanisms and some type of pressure indicator. 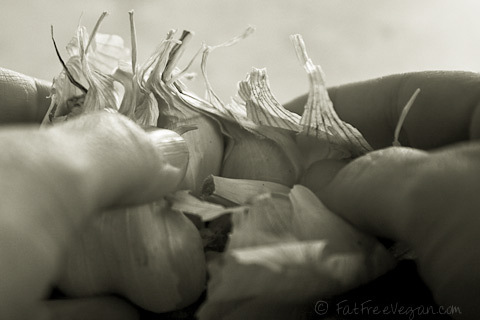 Remove the outer skin on the head of garlic and separate the cloves. Do not peel the cloves. Place the garlic, onion, parsley, thyme, celery, and sage in the cooker. Add the water. Fit the gasket inside the rim of your PC. Make sure that it is clean and fits well. Gaskets that have stretched, shrunk, or cracked should be replace by ordering from the manufacturer. 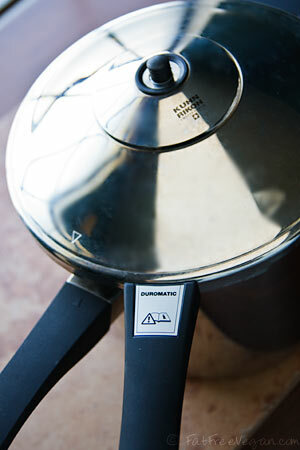 Note the main valve in the center; it regulates the pressure by allowing steam to escape if too much pressure builds up. If it somehow became clogged, the blue-rimmed safety valve next to it would release steam in controlled and safe manner. (I’ve never had that happen.) There are also little cut-outs that you can see along the rim that will allow steam to escape in the event of too much pressure built-up. Again, I’ve never had to see that. Put the lid on the cooker, lining up the arrow on the lid with the lower handle. Rotate the lid handle until it’s over the bottom handle and will not go any further. The cooker must be tightly sealed or pressure will not build up. Reduce the heat so that the cooker stays at high pressure for 10 minutes. If you have an ancient ceramic-topped electric stove as I do, you may have to take additional action. I drop the heat to very low and move the cooker so that just 1/3 of it sits on the heating element. My stove is slow to change temperatures, and I know that the cooker will overheat if I wait for the temperature to drop. Once the temp has dropped, I move the cooker back onto the heat, but I stand by to move it again if the pressure rises. (If the pressure goes past 16 psi, the valve stem continues to rise, allowing steam to vent beneath it.) It’s important to be nearby when using the PC so that you can make sure that the cooker is maintaining the correct pressure so that the contents cook correctly. Once the broth has cooked for 10 minutes at high pressure, remove it from the heat and allow the pressure to come down naturally. This means waiting about 10 minutes until the valve stem returns to the original position. Open the cooker carefully, tipping the lid away from you to allow steam to escape away from your face and any liquid to drain back into the pot. Press with the back of a spoon to get all of the broth out of the vegetables. Keep pressing. You should be able to get out almost all of the 6 cups of water that you added because pressure cooking does not cause loss of liquid through evaporation. If you would like your broth to be heavily flavored with garlic, squeeze 1 or 2 of the remaining garlic cloves out of their skins, mash the garlic, and add it to the broth. Save the remaining cloves. 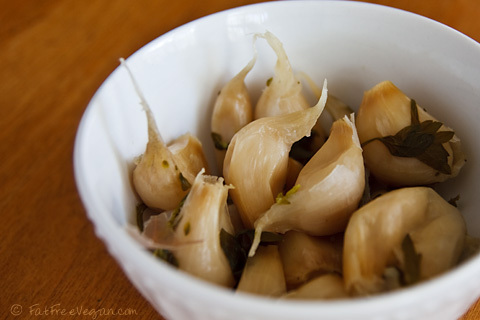 Like roasted garlic, they make an excellent spread for bread or add a great flavor to dishes such as mashed potatoes. They’re just as important as the broth! To make the broth have an “Unchicken” flavor, add the optional nutritional yeast while the broth is hot and stir well before using. You can also add salt to taste, but I prefer to keep it salt-free and add salt when I use it in a recipe. The broth will keep about 3 days in the fridge, though it tastes better when used sooner. You can also freeze it for up to 6 months. I hope this little tutorial has helped convince you that with careful handling, a pressure cooker can be a safe, quick, and economical way to cook. For information about your specific cooker, always check the manual or the manufacturer’s website. For information about cooking times and recipes specifically for the PC, I recommend (in addition toJill’s DVD) Lorna Sass’s Great Vegetarian Cooking Under Pressure, which has helpful charts that give you pressure cooking times for grains, beans, and most types of vegetables. My mother used a pressure cooker for years, and now so have I. 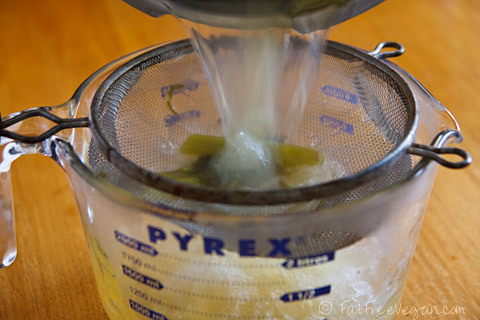 The secret is to add more water that a recipe calls for at first, if one is a new user. I use my T-Fal PC at least once a week. My favorite recipe is for Lamb Shanks with prunes. Recommend that you use a stainless steel only, as aluminum leaches out into foods. I own a pressure cooker but I have never used it, it looks far beyond my expertise of cooking! But I like the sound of this broth; it looks simple and easy to do. So I think my family will have to prepare themselves for tonight, I shall attempt to use our pressure cooker for the first time! Thanks for the recipe. Susan, I just started using a Cuisinart PC and love it. Am eating EFL and wonder about the oil added to beans to avoid frothing. So far I have thrown out the cooking liquid but I notice that you sometimes cook most of the soup under pressure? Also, would you please give me the link to you PC discussion. I am interested in learning about the nutritional aspects of cooking veg. I think I am pouring nutrients down the sink. For now I am cooking various of beans with spices and veg just to flavor them. I use an electric PC, not sure if that would make a difference. Kate, I use an electric PC now, too, and never add oil. No problems whatsoever! I just started using a pressure cooker. I had an electric one I bought 5-6 years ago and never used it. Gave it to someone else and bought a combination pressure cooker/slow cooker. 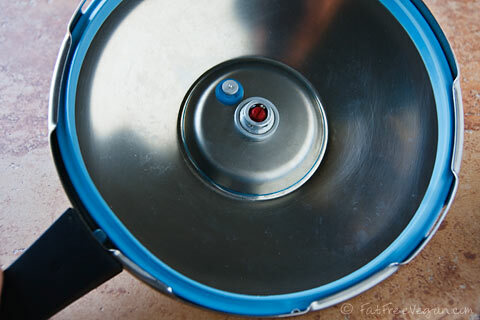 I absolutely love the pressure cooker and I am sorry i didn’t get started sooner. I don’t use the slow cooker because I don’t want to wait to cook my food. Plus, by the time the slow cooker finishes I am not interested in putting the food in containers for the refrigerator or freezer. With the Pressure cooker the meal is done fairly quickly and I have’t lost interest. This is an absolutely fabulous appliance. I look forward to using it regularly. I find it amazing that more people aren’t using it. I have made chicken soup (several times), black eye pea soup, and lentil soup. 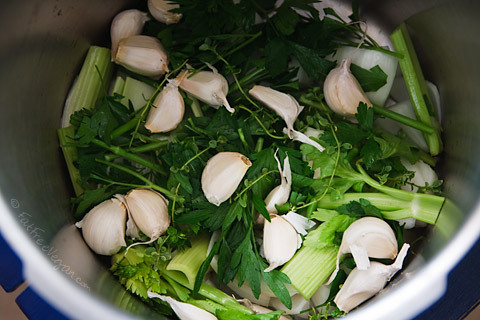 I love the idea of making garlic broth…that would probably be a wonderful addition to bean soup . I think I would also freeze the broth in the ice cube tray and then use them when I am steam sauteing onions, and garlic for stir fry meals. Thank you for the idea. This recipe looks fantastic. 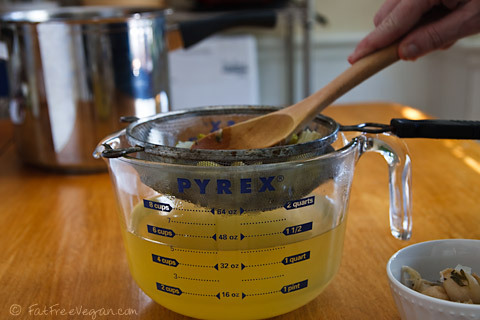 I am always on the lookout for fake chicken broths and their recipes(! ), as I simply can’t stomach the commercial veggie broths – they taste like old overcooked veggies. 🙁 I managed to find the Imagine No Chicken broth in the low sodium version, but where I live the stuff is about USD 5 per carton 😮 so it’s a bit pricy. I found a fake chicken broth recipe on line that uses dried shiitake mushrooms for its flavoring, and it’s a rich enough broth to use on its own as a warm drink and often I’ll just toss in a few bits and pieces of veggies and beans for a quick soup. I’ve also used your recipe for fake chicken broth seasoning, which infuses lovely flavoring for soups and veggies. 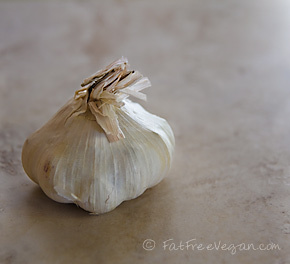 And now I’m planning to give this one a try – since anything garlic is a good thing! Love the sound of this. We are garlic fanatics here. One question — why do you not peel the garlic ? Thanks.